Jon Corzine -- under federal and congressional investigation following accusations that the securities firm he headed illegally took clients' funds before collapsing -- is among President Obama's top re-election campaign bundlers, raising at least $500,000, according to the campaign’s filing Friday with the Federal Election Commission. Corzine, the former New Jersey senator and governor, and former head of Goldman Sachs, is among 127 individuals (dubbed “volunteer fundraisers” in the parlance used by Obama’s Chicago campaign) credited with raising more than $500,000 through the first quarter of 2012. 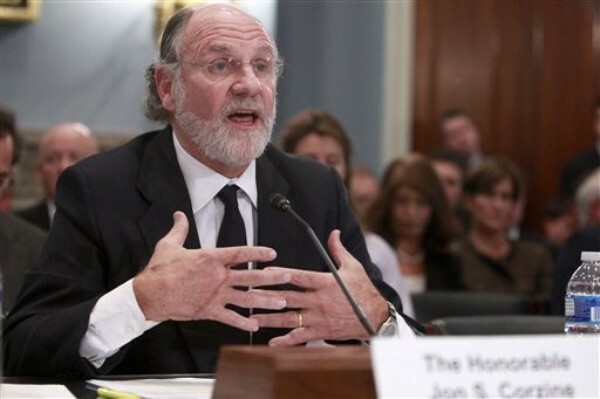 Corzine is being investigated by the Justice Department and the Securities and Exchange Commission; he told Congress under oath last year that, while serving as chief executive at MF Global, he knew nothing about clients’ missing funds. From the banking world, ousted Bank of America CEO Ken Lewis, based in Charlotte, N.C., gathered between $200,000 and $500,000 for the president’s campaign. Since the financial crisis and the enactment of the Dodd-Frank financial reform bill, Obama’s support within the financial and banking world has ebbed, a fact evident from a quick scan of the president’s bundler list. In contrast with Mitt Romney, who reports only bundlers who are lobbyists, Obama voluntarily discloses all of his. His campaign produced a list of hundreds of contributions-collectors arranged in categories from $50,000 to $100,000; $100,000 to $200,000; $200,000 to $500,000; and more than $500,000. At least nine people listed live abroad, including investor and businessman Robert Roche from Shanghai. The president’s roster of friends-who-have-friends-who-donate includes Hollywood and cultural personalities, such as DreamWorks CEO Jeffrey Katzenberg, who rounded up more than $500,000 for Obama. His mansion was to be the setting for a May 10 Obama fundraiser in Los Angeles, but actor and Darfur humanitarian George Clooney, a co-host for the $6 million event, offered up his home when it became clear Katzenberg’s new $35 million castle would not be finished in time. Clooney is currently the catnip in an Obama campaign contest: Small-dollar donors have a chance of being selected to hang with the movie star, the president and 150 mega-contributors at the May 10 event, all expenses paid by the campaign. Movie producer Harvey Weinstein, just named one of Time magazine’s “100 Most Influential People in the World,” helped round up more than $500,000, and actress Eva Longoria bundled between $200,000 and $500,000. Hollywood agent Ari Emanuel, brother of former Obama White House Chief of Staff Rahm Emanuel, is credited with pulling in between $100,000 and $200,000. Vogue Editor Anna Wintour collected more than $500,000, and Deepak Chopra, the best-selling author, speaker and guru of spiritual centeredness, lined up between $100,000 and $200,000 for the president’s re-election efforts. Obama’s bundlers included names familiar from the Clinton years, including former White House Chief of Staff Thomas “Mack” McLarty; Lisa Caputo, a former White House aide to Hillary Clinton; Jamie Rubin, former State Department adviser to Madeleine Albright and husband of journalist Christiane Amanpour; and former Treasury Deputy Secretary Roger Altman, founder and chairman of Evercore Partners. Also reminiscent of the FOB Clinton years are longtime Democratic backers now helping Obama, including political activist and socialite Patricia Duff; Elizabeth Frawley Bagley, named in 2009 as the State Department’s first special representative for global partnerships; and J Street co-founder and attorney Victor Kovner, and his wife Sarah, who served at Health and Human Services with former Secretary Donna Shalala during the Clinton administration. Also disclosed this week were Obama and Romney fundraising totals for March, with the president’s campaign pulling in $35 million to his likely opponent’s $12.6 million, the Hill reported. Obama’s total was supplemented by $18.7 million raised by the Democratic National Committee; Romney’s tally was boosted by $13.7 million collected by the Republican National Committee.